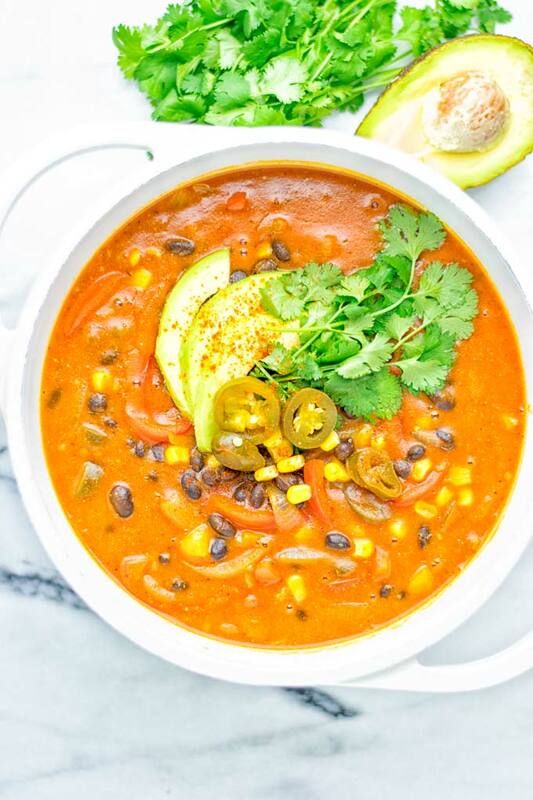 This Spicy Garlic Enchilada Soup is super easy to make in one pot, and entirely vegan and gluten free. It’s also protein rich, packed with bold flavors and so delicious. Not a long time ago, I made an Enchilada Lasagna (vegan, gluten free). It is one of my favorite lasagna recipes. I’m so into these flavors. 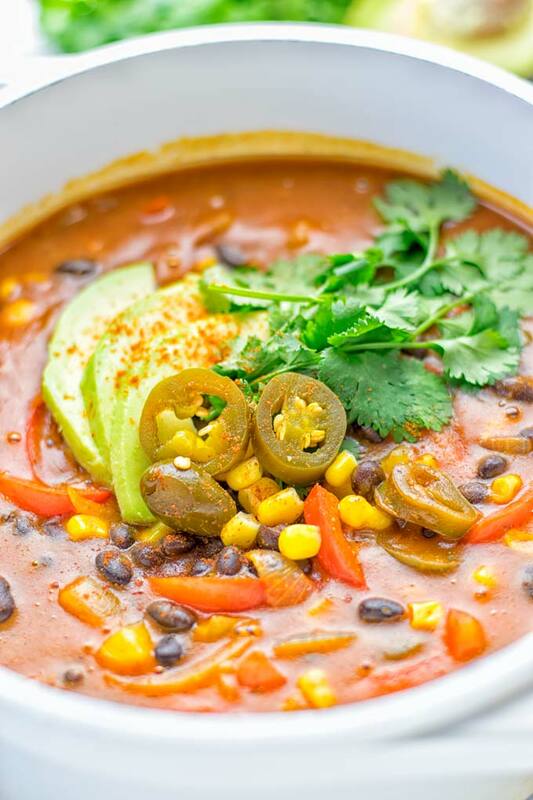 Today, we will continue to celebrate these flavors with this Spicy Garlic Enchilada Soup together. 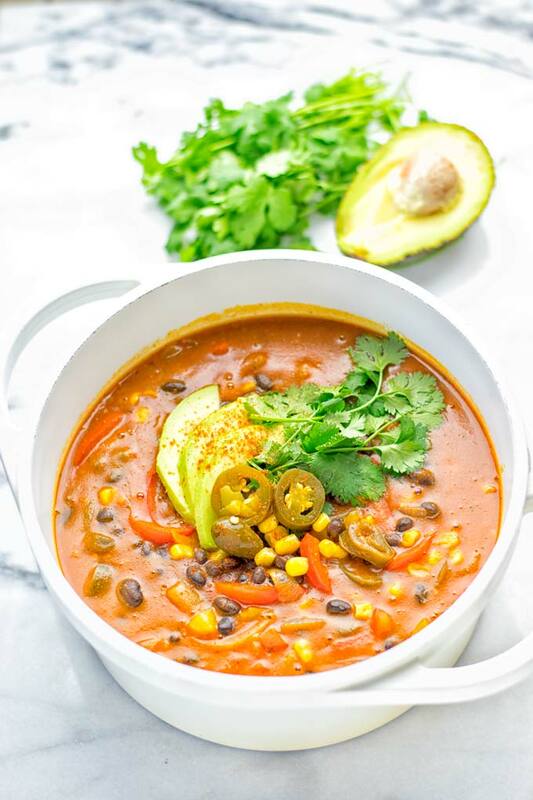 It’s spicy, garlicky, flavorful, made in one pot, hearty, mouthwatering, protein rich, satisfying and seriously a must make for any good food lover. 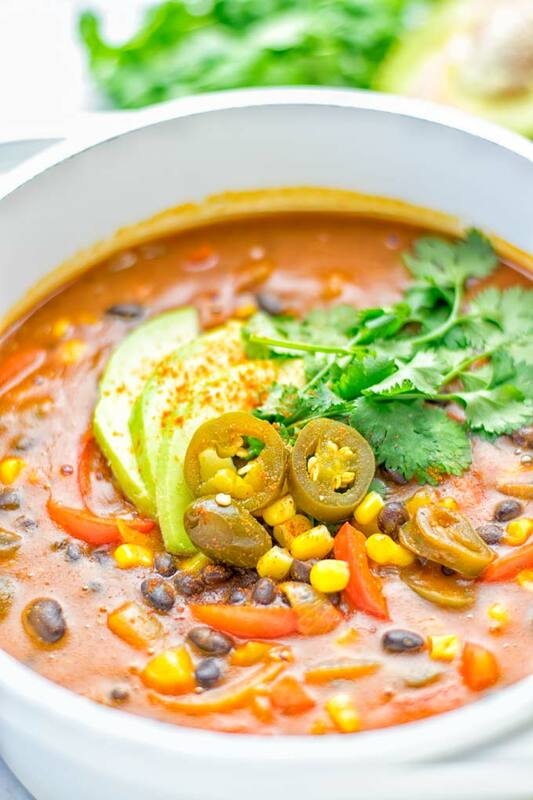 Enchilada soup is often made with chicken, cheese, and topped with sour creme. 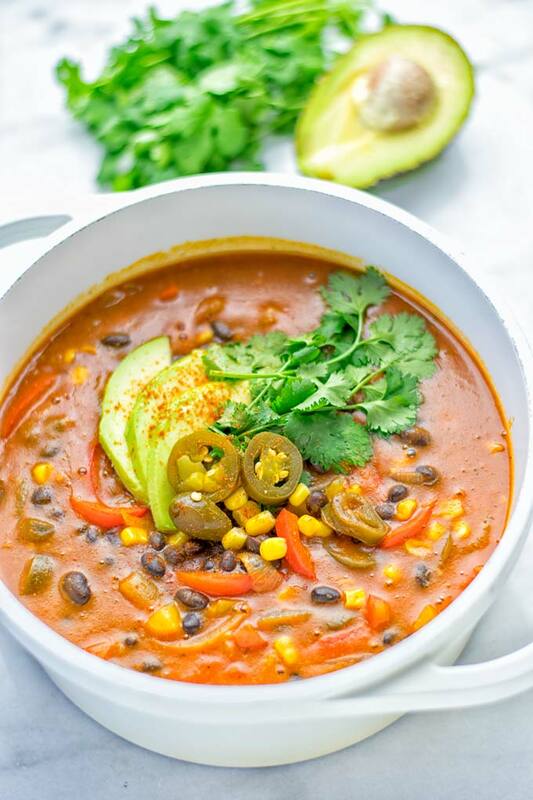 I keep this recipe really simple, and make it vegan and dairy free at the same time. One of the base ingredients I used is enchilada sauce, which you can find in almost store or online. Also I added a bit of enchilada seasoning, vegetable broth, and of course garlic. My all time favorite. In a pot, heat a bit of oil or vegetable broth for frying without oil. Add garlic, optional onions, and fry them for around 5 minutes. Next add enchilada sauce and seasoning, black beans, corn, vegetable broth and optional jalapeños and bell peppers. Cook for 10 minutes more on medium heat. It’s an amazing dinner, lunch, meal preparation, or even for work lunches. Done in no time. 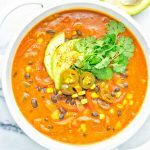 My Spicy Garlic Enchilada Soup is a winning combination, if you’re looking for fast and quick family dinner ideas. A fantastic option also for potlucks, get togethers. Note: I’m a guy who likes hot food a lot. If you’re sensitive to spicy food, please scale down the optional jalapeños and use less enchilada sauce and more vegetable broth. Also scale down if you have a really spicy enchilada seasoning. This will depend on the brand. Some are mild, some are really strong. I would say start with 1 teaspoon and test from there to your own liking. Any enchilada sauce will be different depending on the brand. Some a more spicy some are less spicy. Or maybe you have a homemade version that you already love in your family. Always adjust your own preferences and tastes, you know yourself better than anyone else. I know we’re all busy and time is lacking. So how about some great meal prep recipes! 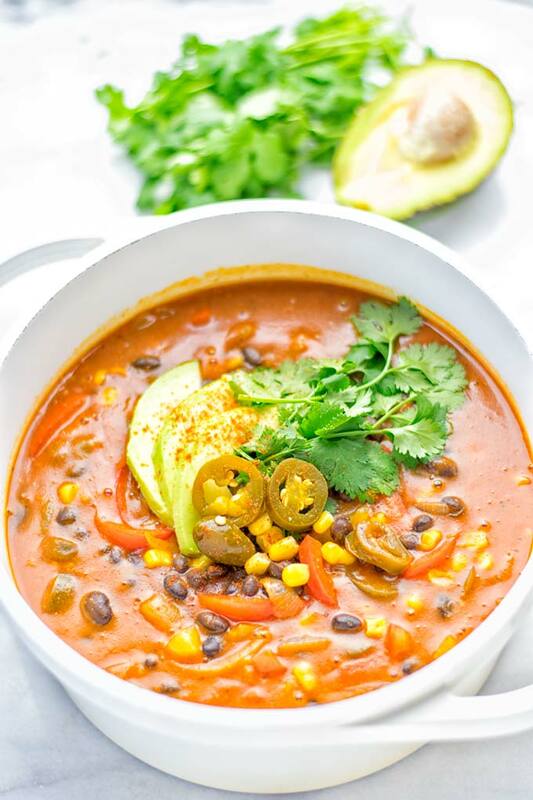 Always one of my favorite is this Vegetarian White Chili which is entirely vegan, gluten free, and made in one pot. It takes only 25 minutes from start to finish. Also a big favorite of mine is this Lentil Chickpea Yellow Curry. Both are super easy and insanely delicious options for easy meal prep. But there is more. Feel free as always to use the search bar, if you’re looking for more great recipe ideas. 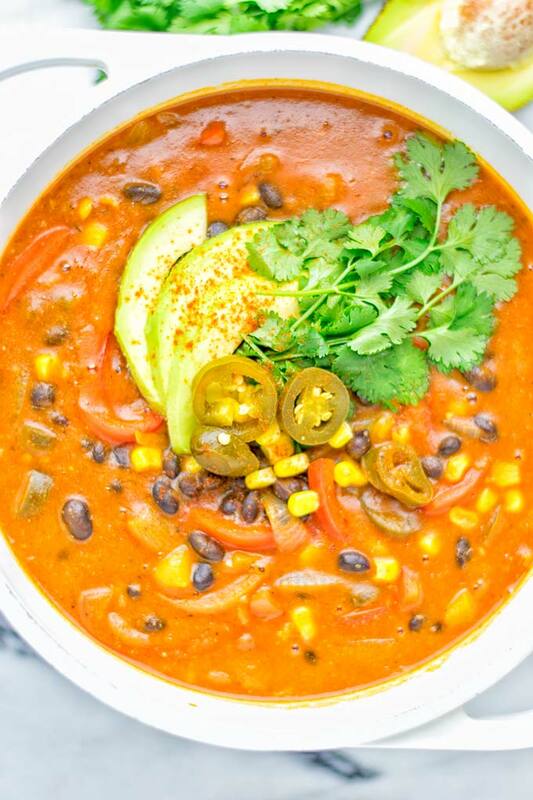 Try this Spicy Garlic Enchilada Soup and tag me on Instagram and Facebook with a picture. Love seeing all your remakes, Florian. Cook for 10 minutes more on medium heat. 5Serve in bowls or on plates. Thank you for another simple yet flavorful recipe. Perfect timing for me for you to post it to your blog since I was trying to decide what to make from what I had on hand last night rather than have to go to the store. Everyone enjoyed it and it was perfect for a quick, one pot, autumn weeknight meal. Disappointingly (for me) there weren’t even any leftovers that I could take for my lunch today. 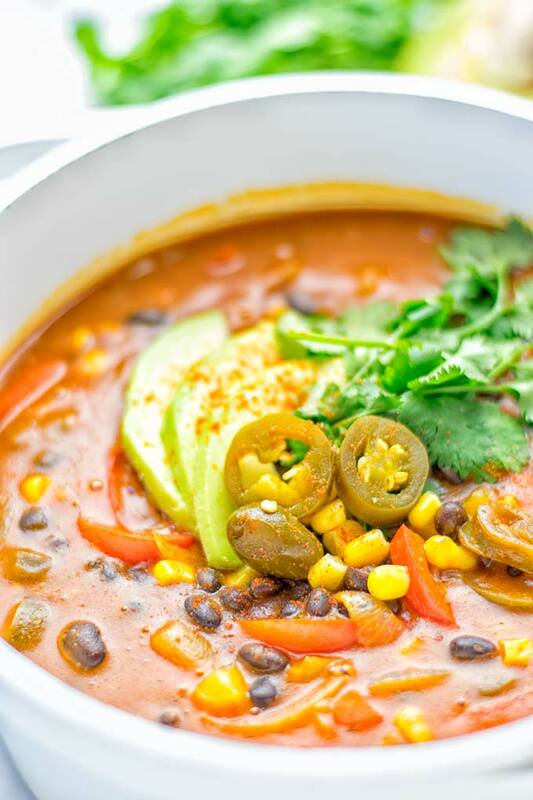 You are definitely right to warn people to adjust seasonings to taste based on the specific enchilada sauce and seasoning mix used as well as individual preference. I didn’t even realize there was a prepackaged spice mix called “enchilada seasoning” and had to look it up online to find out what was typically in it then dithered quite a bit over what, if anything, to substitute in its place. Ended up just increasing a bit the spices that I normally use when making my usual enchilada sauce to counter the dilution from the vegetable broth in the soup and the result was excellent though I might cut back on the minced chipolte chili by one next time. Thanks again for the wonderful recipes and inspiration. Thanks for your amazing feedback and making it, Denise! Glad it was such a big hit! I’ll have to try with butternut squash next time! Seriously in love with this recipe. Making it for the second time in the last two weeks. Why? Because everyone loved it and said “make that enchilada stuff again”. So happy to hear that, Janell! One of my favorites! I hope you’ll find lots of more recipes to try!